Almost every year, I start out with a list of things I am going to sew. More accurately, I make lists of what I’m going to sew. Multiple lists. On various scraps of paper that end up in various places. Ideas land in my paper planner, scribbled in the margins of a journal or on my coquis paper. It’s unbearably inefficient and I seriously frustrate myself. This year, inspired by the beautiful Make Nine posts popping up all over Instagram (and hosted by Rochelle New) I vowed to organize my sewing plans for 2018. I realized as I tried to make my list of nine things that many of my sewing plans are actually pattern hacks or boring basics. 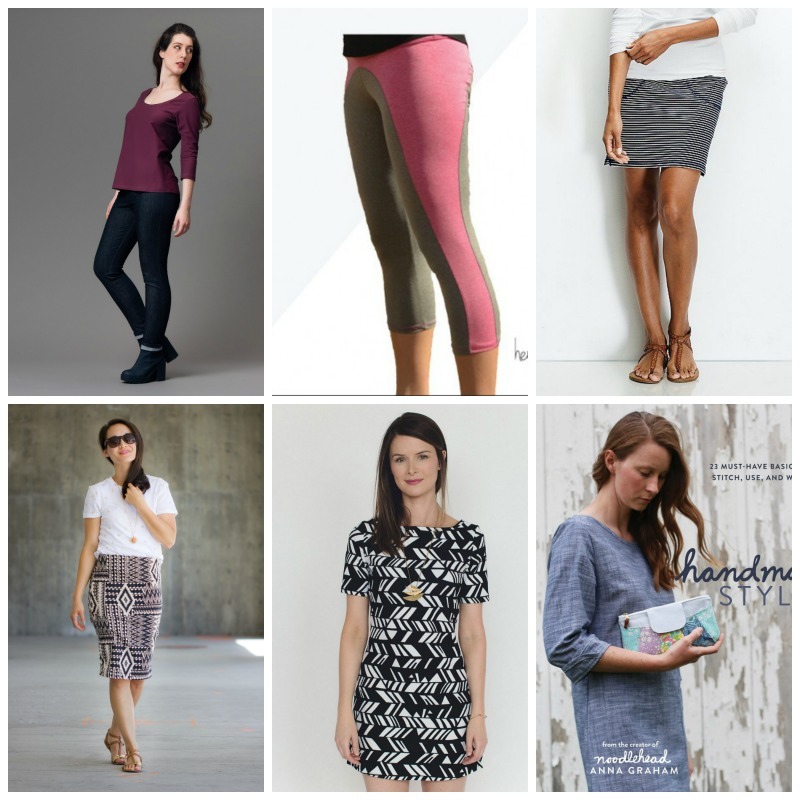 I wanted to reserve my Make Nine list for more challenging sewing and leave tees and leggings on the basics list. So, I expanded the idea to Make Nine, Hack Nine and Basics. I’m hoping by documenting all of this here I will keep myself organized and won’t end up straying off track. + The Cascade Duffle from Grainline. It’s a coat and that is super scary (it has a zipper AND toggles! Woah.) but it’s super cute and I wear my other handmade jacket a lot. It’s time to add another one to the mix. I can’t decide if I want it in wool or sweatshirt material, though. Hmm. + Acacia Underwear from Megan Nielsen Ok, I know they aren’t exactly challenging to sew (I don’t think?) but I’ve never made undies before and I feel like it is time. + Lisbon Slip from Seamwork! Mostly I’m adding this one to the list because I want to wear it around our airbnb while we are on vacation this summer. + Lander Pants from True Bias. A perfunctory assessment of my current wardrobe revealed a glaring lack of “things to wear on the bottom half of my body”. Basically, it’s more fun and easy to make tops so I tend to gravitate in that direction and keep wearing jeans and other ‘bottoms’ that I really don’t like that much. The Lander Pants, on the other hand, have been calling my name since they were released. Given how many people have these on their Make Nine list, I don’t think I’m alone. Wish me luck on these, I’m very intimidated by these, too. + Sandbridge Skirt from Hey June. I have made this before but I’d like one in denim. I need a decent, well-fitting denim skirt. Like I said, bottoms! + Ah, yes. The Sophie Swimsuit from Closet Case Patterns. I said I was taking on challenges, right? I mean, what is more challenging than a bikini! I think this high waist will work for my body but we will find out! + Salie Jumpsuit from Closet Case Patterns. I love this pattern and also made this one already but it’s so comfortable I want another out of more structured knit material. + The Sonya from Seamwork. What’s more wearable than a sweet shift dress? Plus, the Sonya has a sweet sleeve overlap detail. + View Ridge Top from Straight Stitch Designs. I’ve been dying to make this top for a long time. It’s got the look of a very wearable classic. These are the patterns I want to hack, my hack nine, if you will. + Marigold Dress from Blank Slate Patterns. I’m hoping to create a shirt dress version by creating an a-line silhouette and pulling the button placket down the full length of the dress. + Georgia from Seamwork. I have modified this before and I need another dress version like my previous hack as well as a simple, rayon top version. + Sallie Jumpsuit modified into an a-line dress. Yup. The Sallie is in my Make Nine and Hack Nine list. I have been dreaming of extending the top of the Sallie, with the v-neck and the closing straps on the back, into a swishy, a-line dress since I made my first one. + Biscayne and Sanibel mash up from Hey June. I love the Biscayne top from Hey June because of the hidden placket. But, I got this idea to turn it into a dress based on a secondhand dress from JCrew that is essentially a Biscayne on top of a Sanibel Dress and now I am obsessed with combining the two. A Bisca-bel dress? Or a Sanicayne, maybe? + Datura from Deer and Doe. I love the idea of extending this top to a tunic length or dress length. Especially with the stunning back placket as a detail. Yum! + Halifax Hoodie from Hey June. I love hoodies but I need them to be tunic length so I can wear them with leggings. I mean, if we are going for comfort, let’s go ALL IN! So, I hacked the Halifax, not yet blogged, to make it longer and it’s flipping adorable. I need a second one for those cold days when I want to work comfortably at home but still be publicly presentable. + Split Tank. This is more of a baby of an idea. I saw a ready-to-wear tank top made in a stunning lawn fabric that was split right down the middle with a seam covered in bias tape and I’ve been obsessing over it ever since. I still need to find just the right camisole pattern to use for hacking purposes but I’m keeping it on the list to be sure I bring this vision to reality. + Linen and Lace Top. This is the second baby of an idea. I have a gorgeous, wide lace I would like to use to add interest on the upper half of an a-line white linen top and I just haven’t found the right pattern to hack yet. I want it to look sort of like this Madewell top but without the hem / sleeve detail and all-white. I need something with a split bodice, similar to the Alice Top but with fewer gathers. Maybe a View Ridge? I’ve got to work on this idea. + A one-piece workout outfit. I saw this outfit from Ripple Yoga and fell in love. I need to combine a tank top with joggers to recreate it for my Pilates classes. My shirt is ALWAYS falling down while I work out and I hate it. The Basics list is made up of a mix of truly basic pieces missing from my wardrobe and pieces that I think will extend the versatility of my current wardrobe. + Plantain Tee from Deer and Doe, these are already done! Woot! + Sloan Leggings from Hey June. Because, you know, leggings are needed for all the damn tunics and dresses described up above! + A basic Striped Skirt. Similar to this Hanna Anderson skirt because it’s cute and looks nice and easy for everyday kid/mom life. Oops, looks like they no longer carry the skirt in my picture. Even more of a reason to make my own. + A Straight, Ponte De Roma skirt. Like I said, I need more things I can throw on while showing off an interesting handmade top. I’m thinking of self-drafting this or possibly following this tutorial from Delia Creates and making it in charcoal or black. Although, I love her striped version. + Mesa Dress from Seamwork. Easy to make and versatile, the Mesa is an easy travel dress. 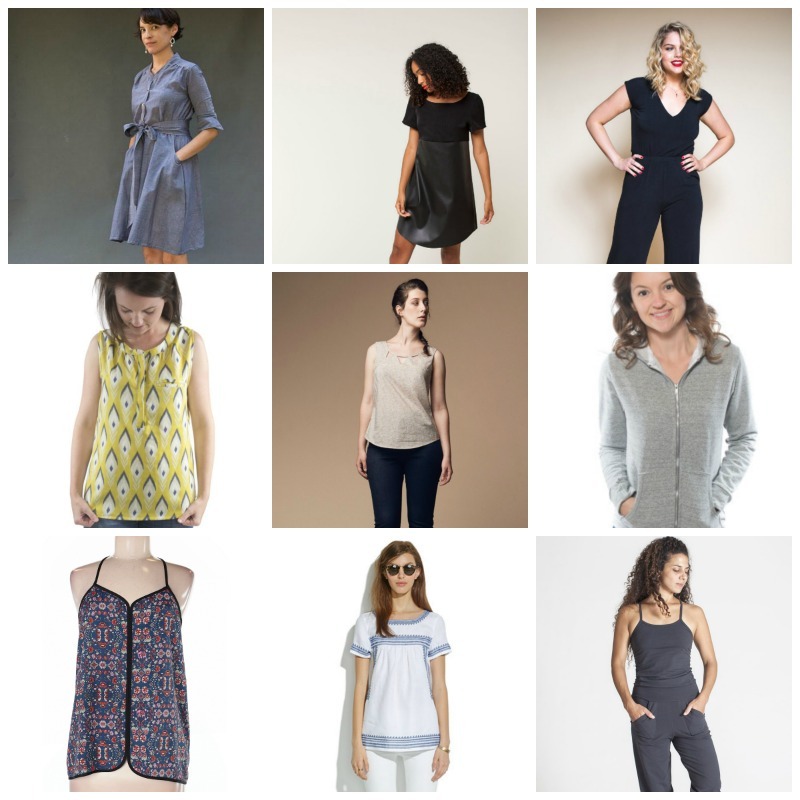 + Chambray tunic from Noodlehead. This has been on my list for so long! I love the idea of gardening and sewing with this casual dress and a pair of leggings. + Layering Dress. I’m making this idea up. It’s a camisole top combined with a straight skirt for a dress that wears easily under cute tops. It’s essentially an excuse to make more cute tops. Any ideas on a good pattern? Well, I definitely have my work cut out for me but I’m feeling so much better prepared to hand-sew my wardrobe in 2018 than in years past. Time to get ticking some of these 27 items off the list! Ooh, 26! I already made those plantain tees. Wait! It’s 24 because I counted wrong! By the way, this post contains affiliate links. This means that, at no cost to you, I get a small commission off your purchase while you support an indie pattern designer! Win-win. I love your make 9! I am especially excited to see your version of the Cascade Duffle! Hi I love the idea of hack nine. reckon I’ve git a few too, but already have a summer AND a winter make nine (second year of sewing and am on holidays thinking I’ll just see all year like this, ha ha) so am trying not to overload it!! It’s just so hard not to overload, isn’t it! But, so fun to go for it anyway. Thank you – just bought the View Ridge pattern. Also, couldn’t you make the southport cami into your camisole dress? I think that would be an easy hack. I love all your lists! It’s so hard to narrow down, isn’t it!?!? I think the Alice Top pattern would work perfectly for that Madewell top. You can easily reduce the gathering (by a lot, really), and add sleeves using a t-shirt pattern you already have (Scout Tee, if you’ve got it). And I seriously think we should work on the yoga jumpsuit together! I say Hudson Joggers pattern + a cami pattern + easy waist band ribbing. I agree on the Alice top, great idea. The sleeves are a little tricky since the cap sleeve makes up a portion of the under arm scythe. But, not impossible. And YES! WHEN are we going to make yoga jumpsuits together?